“I love you, Mama,” Young Indiana said as we ate lunch, and then leaned over. I leaned over to kiss him and he said, “Ah ah ah! I will do it!” and kissed my cheek. Beyond that, however, I’m pleased to report that the agent likes the PADYA proposal, and while we haven’t decided our plan of attack yet, I’m exceedingly glad he likes it and am really looking forward to figuring out how we’ll get it out there. So that’s exciting! I am very much impressed by the braid. I started trying to learn to braid my own hair, not in any fancy way, just a basic braid, about six months ago. I've achieved a braid that will work while I'm sleeping, but man, it is really hard to get a tidy effect for the daytime. I've started peering myopically at characters on TV who have braids -- and you know what? Their braids are messy! So that's something. You must have a higher quality of braids in Ireland. Or I'm looking in the wrong places. I do everything backwards behind my head. It took me weeks to figure out that my initial braids looked wrong because when I pulled the braid around to the front to finish it, I started braiding in the opposite direction. Brains are weird. I wonder if there is some crazy exercise one could do to allow braiding in the proper direction from behind one's own head. But it might result in a wormhole or something, you know? It's never too late to be a Pixel-Stained Technopeasant Wretch! 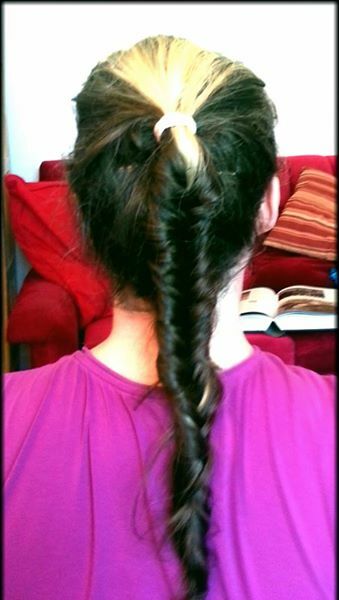 I have been braiding my hair in a regular braid since i was a kid--never did master any of them fancy kinds, though. I am mightily impressed.